Nice & fresh, just like I like it! Mom’s at it again! She is working hard at finding me treat alternatives to use on our adventures and for dog training treats. Since we’ve been home cooking, the “dry kibbles” that I normally used for snacks and treats aren’t the best option. 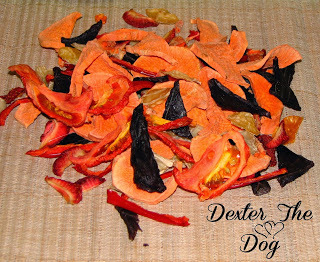 So, here’s another trial at to-go dog snacks that will double as my meal. 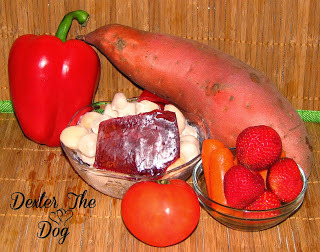 We did find that the sweet potatoes and red peppers didn’t digest as well this way. Dr. Judy said maybe a bit too fibrous and large since I just gobbled them and didn’t “chew, chew, chew” as Mom always says. So next time, we’ll try smaller pieces, maybe another veggie, and maybe tossing them in the oven to crunch up a bit. So, stay tuned!